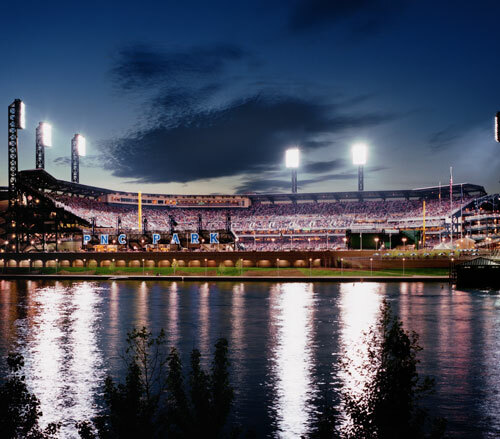 The construction of PNC Park has made a dramatic change to Pittsburgh's North Shore. The intent of its design was to make the ballpark an attractive destination. At night, various lighting techniques are used to accentuate the park's beauty and to enhance its draw. 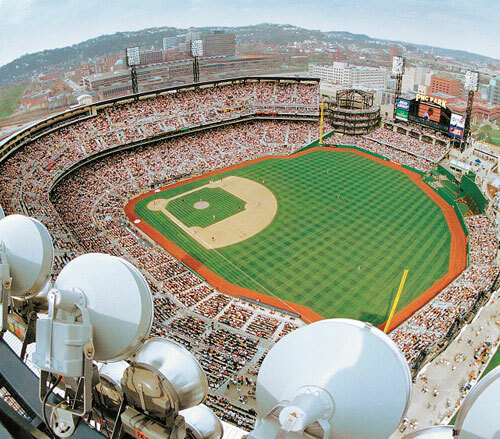 The Pirates opened PNC Park with an exhibition game on March 31, 2001 & the first game played on April 8, 2001. 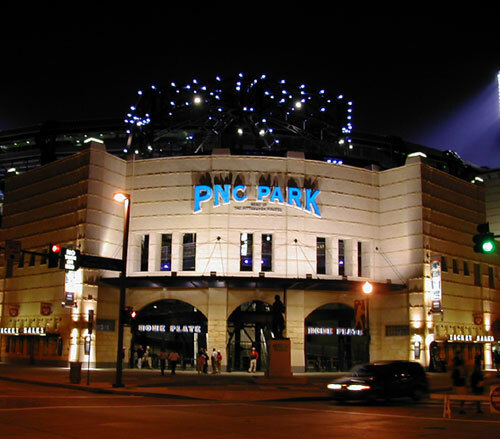 The lighting at PNC Park is both decorative and functional... it is an integral part of the entertainment experience. On event nights more than 1.5 million watts illuminate the playing field. There are seven 180' light towers, each equipped with ninety-six 2000 watt GE "Ultra Sports" fixtures. To provide full coverage with a minimum amount of shadowing, each of the six hundred seventy two fixtures were aimed at a predetermined point on the field. To accomplish this, the field was sectioned into a 30-foot grid then each light was adjusted with the use of a light meter. Banners on the exterior facade of the park are illuminated using locally fabricated lighting fixtures. Each fixture has two 100W metal halide lamps hidden by a metal shroud. On the tops of the exterior wall pilasters, custom fabricated louvered lighting fixtures give the park a crown like appearance. The pilaster lights are equipped with fluorescent lamps and finished in powder coat. Lighting in the outdoor food courts has a festive look. 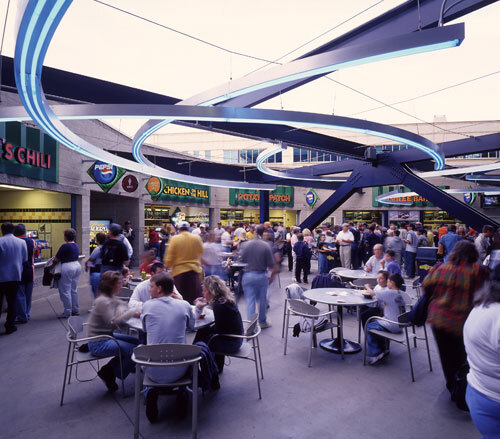 The west food court uses low voltage festoon lights giving it an old world look, while the lights used in the east court are avant-garde with cool cathode neon, housed within curved custom metal channels, all of which are supported by a cable grid. 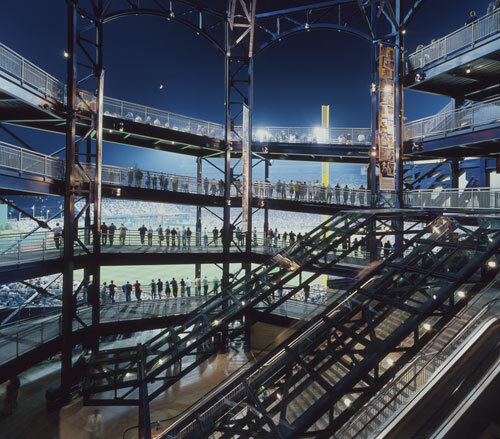 The lights between the main ballpark and the administrative offices are also festoon, but there the designs convey a more industrial-warehouse look. Even on non-event days the park has a strong visual appeal. At night, the structural steel of the light towers and spiral pedestrian ramps are silhouetted against the sky with blue lens "Jelly Jar" fluorescent fixtures.